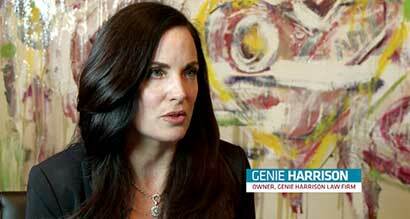 Videos on Genie Harrison discussing sexual harassment and what motivated her to become a women’s rights attorney. In this two-part video, attorney Genie Harrison discusses sexual harassment on Spectrum News. Each video is about 10 minutes long. In this YouTube video, Master Practice by Power Liens and Verdict Videos, Genie Harrison, a survivor of sexual abuse, discusses her personal history and what motivated her to build a successful sexual harassment law practice. In this video clip of Genie Harrison speaking at the 2017 Consumer Attorneys of California (CAOC) conference panel “For Women Jedis: Women In The Courtroom,” Genie gave an inspiring speech about her keys to winning at trial. 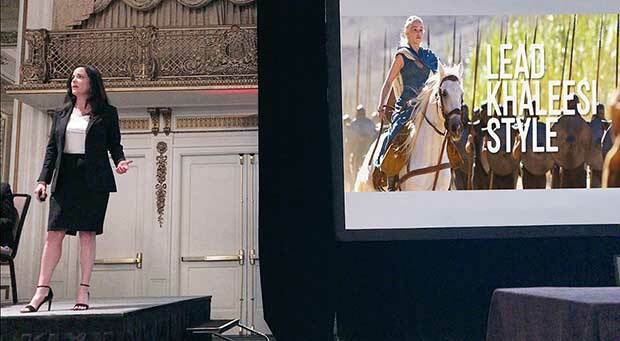 Her entertaining presentation incorporated storytelling elements from Game of Thrones — sorry for the spoilers — and inspired those who attended her presentation with a cool mashup of Daenerys Targaryen clips and her “Faith in Myself” speech. CLICK HERE > (or on the YouTube video below) to watch the video so you can be inspired, too. 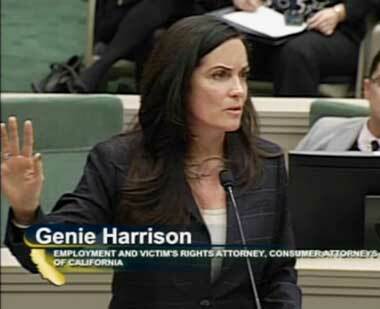 Genie Harrison has testified on behalf of sexual harassment victims to the California Assembly Rules Subcommittee at the hearing on sexual harassment and retaliation in Sacramento. CLICK HERE TO VIEW VIDEO > of the hearing and the brave and compelling testimony of victims, beginning with Pamela Lopez at approximately 2:21. Genie’s testimony begins at approximately 3:44, which urges a systemic solution to a systemic problem. In this YouTube video Genie Harrison offers tips to victims of sexual harassment. In this YouTube video Genie Harrison discusses how women should come forward to protest sexual harassment in the workplace to protect themselves and others. In this YouTube video Genie Harrison discusses certain sexual harassment issues that you may encounter in the employment world in places like Silicon Valley or where employers or founders of new companies abuse their power. In this YouTube video Genie Harrison shares advice for parents and young women who may encounter sexual harassment from college professors.